How would you like to win a Montana Cuvee Wine Decanter? Perfect in time for, dare we say…summertime. 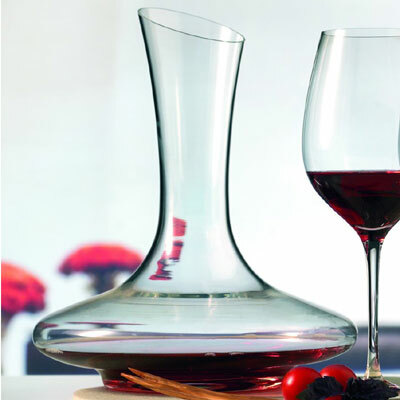 This beautiful and simple wine decanter design can hold up to 1.5 Litres (51oz) perfect for entertaining. It is also suitable for a variety of events, whether its dressing a table over the festive period or simply enjoying a bottle of red by candlelight. If you would like to be in with the chance of winning such a splendid glassware piece then enter our competition below. This competition ends 07/06/2013 so get your entry in now! It would look lovely on the dinner table and also I am building a little bar so would be great for this too. Given the great big stash of wine I have, this would compliment it perfectly! Why do I want to win this decanter? Because it’s completely beautiful, and I love love love it. Why else?! Great for aerating those special occasion wines. I would really like to win this prize for my parents to celebrate their 45th Wedding Anniversary this Summer! I would like to win this as a lovely wedding gift for my niece and her fiance. I’d like to win this as a present for my aunt, she’s a big wine fan. I would love this as I love wine! Part of the pleasure of enjoying a good glass of wine is the look and feel of a good wine glass. How nice to have a beautiful vessel to pour it from too. Because it’s stylish and gorgeous, like my husband, who would love and appreciate it…..well he doesn’t’t me!! Because I don’t own anything as beautiful!! So I could give it to my husband who has a collection of wine & accessories…This would be the perfect addition! It looks lovely and stylish and I would be the hostess with the mostess if I had that sitting on my table! I wanted to win this as I don’t have a wine decanter and it would be great for entertaining as it’s so beautiful. What a lovely elegant shape – perfect for dinner parties at my house! i want it to for my newly decorated living room. it would be a classy decanter for a classy girl! great prize, made for my lounge! I would love this as I’m sure any wine would taste as good as it looks in this amazeballs decanter ! I would love to win this for my husband’s upcoming birthday. It’s very elegant, and would be great to use in the garden as the wide base means it would be really stable and not get knocked over easily. I just love the design and the wide base would make letting the wine breath a much quicker process too. Style and function ! We don’t have a decanter, yet love red wine! It’s an eye-catching piece and I’d love to win it. I’d love to win because this is such a lovely decanter it may distract from the fact that I sometimes serve quite ordinary wine at drinks and dinner parties! My other half is obsessed with airing his reds but we have not as yet progressed to a decanter and this is a prime opportunity to do so in style! It’s exquisite. Simple lines and a beautiful item. I would love to have this to treasure. It’s very stylish and the perfect way to serve wine. Wow its just such a great and unique prize. I would love to be able to decant wine properly. Plus it would make a beautiful table piece. This is a truly beautiful decanter that would make such a difference to the taste of a nice wine. Because I like pretty homewares. My friend Mark would love this. He’s OBSESSED with red wine! What a lovely elegant prize to grace any table. it would just make the perfect party piece! It is so beautiful and stylish and would grace any dinner table. because my eldest knocked ours over the other day! I would love to win it to be able to bring discerning style and craftsmenship to my home and grace to my table. This is a very stylish decanter, would love to own it. Very stylish decanter, would love to own it. It would take pride of place in my new kitchen. Reminiscent of a ships decanter but wuth a narrower base. Love it because its so classy! Such an unusual and gorgeous shape – would look just as good without wine in it! I like wine, and have never had a decanter. We entertain a lot and wine is always a favourite, we have also figured out some of the wines need to breathe and it makes a huge difference to the taste.I really would love to have a decanter to give my wines their best shot! It gets first prize in the best looking wine decanter class. This decanter is a beautiful and stylish piece of wine ware that would add a degree of sophistication to our dining table. this Decanter would be great for summer. Lovely decanter would look great at our dinner parties. Very stylish & impressive ! My husband would love this, it will go perfect with his Chateau Duhart -Milon i have just ordered for his birthday! I love to win it as we currently don’t have a decanter! A good Claret would look great in this. I could justify buying my favourite expensive red to go in this beauty. I would really like to have one of these decanters. I amncurrently unemployed and can’t afford one like this. What a fantastic piece, would look beautiful on any table. Especially mine! because i dont own one and it be nice to pour it from a decanter than a bottle! Looks very stylish and different! Love this product! Would be wonderful to win this. It’s beautiful and would get a lot of use in our house! I would love to win the decanter as a surprise treat for my mother-in-law, it’s so hard to find things that she would like but this would be PERFECT!! because my husband loves red wine but always complains he can’t decant it! Because it is elegance in glass! It would help me to create a classy atmosphere for a dinner party! Perfect for adding sophistication to a candle lit dinner. This is so similar to a ship’s decanter. It would be great on my table. oh i would loooove one 🙂 thanks !! Decent wine needs to be drunk in style and this is the way to present it to friends and family! So elegant and beautiful, would look perfect on my table when entertaining! I love red wine…red wine looks VERY nice in it…I MUST have it!!!! I’d like to win because it’s a lovely prize! I’d love to win this lovely decanter, it’s so stylish! Great decanter! Would love to win it. It would look nice in candlelight and with all these power cuts it would help pass the time. Would be a great xmas present for my mum! i would love to win it as i am beginning to entertain friends and family and so this would be a beautiful addition to my collection of tableware!